Mr. Saliya Rajakaruna, fondly known as Raja among his friends; the former Scouts Field Commissioner, Queen's Scout, and Woodman; was an exceptional human being who dedicated most of his life to promote scouting in Sri Lanka, and to improve the social well being of those around him. Raja was like a parent to his younger siblings when they were growing up and to hundreds of Children at SOS Childrens' Village at Piliyandala during his tenure there, as the Director from 1983-2000. Raja was born in Kandy on August 24th 1940 and passed away on September 16th 2012 leaving behind his wife, Violet and son, Naradha. Raja had his entire education at Dharmaraja College Kandy. As a student Raja was an all-rounder. He played Cricket, soccer, hockey, and volley-ball for his College. He also represented the Senior English Literary Union of the College in 1960 and in 1961 he was the Vice President of the Senior Sinhalese Literary Union. In sporting activities Raja was well known as a cricketer, playing for the Dharmaraja first XI team during 1958-1960. He also played for the Central Province Cricket Team in 1960. As younger school boys, we still recall Raja’s bowling as a spinner and the opening batsmen well know to be an anchor batsmen holding up the innings. In 1959, he won the best bowler price of the 1st XI Cricket Team of the College, and in 1960, during the big-match against Kingswood College Kandy, Raja was adjudicated the best bowler of the match. His bowling record of 7 wickets for 20 runs, during Dharmaraja Vs Trinity College, encounter in 1960 still remains unbeaten. However, Raja’s biggest contribution to his school and the Nation undoubtedly was in the field of Scouting. He joined the 1st Kandy (Dharmaraja Scout troop) as a Cub-Scout and went on to become a Queen’s Scout in 1958 and became the Troop Leader the following year. In 1963 he together with a team of a handful of Senior Scouts in his troop, undertook a stupendous task of organising an all island jamboree, joined by over 1000 Scouts, to celebrate the Golden Jubilee (50 years of Scouting) in his School. The Governor General Mr. William Gopallawa, who was the chief guest at the “Scout-o-Rajan” which was the grand finale of the Jamboree, had been so impressed and pleasantly surprised of the organising capabilities of this Scout troop, that he had later sent a letter of commendation appreciating Raja’s contribution to Scouting. For Raja, Scouting and his alma mater were inseparable. Having completed a colourful student ship in his school he joined the College Staff in 1961 as the Librarian, Assistant Warden of the College hostel and Assistant Scout Master. Later he served his School as the Group Scout Master, and the Junior Cricket Coach and the Welfare Officer of the School Hostel. Raja went on to follow training programmes related to Scouting and won the Wood Badge in 1969 and Cub Wood Badge in 1970. In the subsequent years he participated in the national leaders’ trainers course, Public Relation seminar, the 5th Asia Pacific community development seminar etc. In 1977 he followed the Asia Pacific 3rd professional course for scout career executives in the Philippines. In 1999, he was awarded a medal of merit for president scouts, and in 2002, Veteran’s scout award. 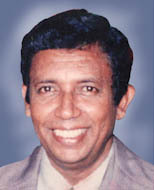 Raja joined professional Scouting in1969 as a Field Commissioner in charge of the Uva Province. In 1974 he became the Filed Commissioner of the Central Province and continued holding that post until he took leave from his Scouting carrier in 1987 to join the SOS Movement as the Project Director of the SOS Children’s Village, Piliyandala, where he cared for hundreds of children in this Country until he retired in the year 2000. The president of the Worldwide SOS Kinderdorf International Mr. Helmut Kutin had sent a letter of commendation appreciating Raja’s yeoman contribution to SOS world. Raja’s commitment for his Alma mater and Scouting never faded. He took steps in 1978 to form Old Rajans' Scout Association; to which he was committed for the rest of his life. According to the Scouts' motto Raja wanted to "be prepared" even for death. To honor his request of a quick funeral, 1st Kandy (Dharmaraja) Scouts were prepared for an honorable farewell to him. Raja was dressed in a Scout uniform for his final journey, amidst a guard of honor accorded by Scouts. The leaders of the Sri Lanka Scout Association were pall bearers at the last lap to the funeral payer on Monday 17th September 2012 at the Mahaiyawa Cemetery, Kandy. Most of all, we remember our near and dear friend Raja because of the example one can draw from his life, which is, his exemplary character as a perfect human being and a perfect gentleman. His character is worth emulating by all human beings. He will be immensely missed by his dear wife, son, sisters and brothers and by everybody who had the good fortune of associating him even for a short spell of time.